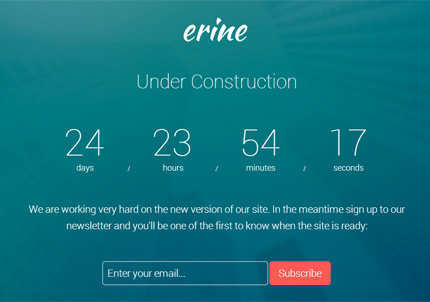 Today’s freebie is another responsive Coming Soon Template made with Twitter Bootstrap, named Erine. 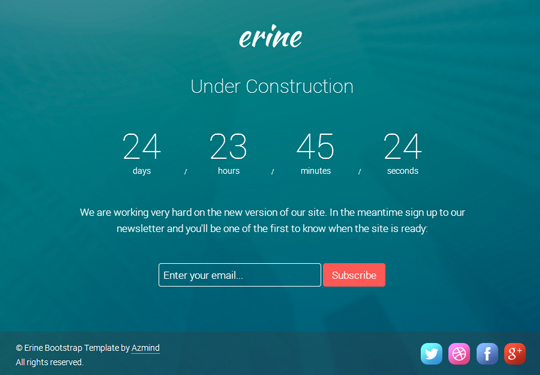 If you’re searching for a coming soon page for your new product launch, Erine is for you. 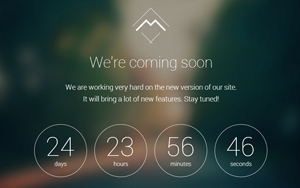 Some of its main features include: a responsive layout, fullscreen background, countdown timer and AJAX subscription form with validation. I’ve also used some big and colorful social icons from the Gradient Social Icons Set. The template is simple and easy to use and customize. 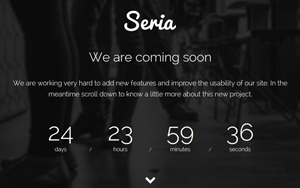 Below you’ll find the full list of features, the preview & download links and a quick guide of how to use it. Enjoy! To install the Erine template just extract the zip file you downloaded above and upload it in your server. This will count to “25 September 2014”. In the “subscribe.php” file (/assets/subscribe.php) you can insert the email where you want to receive the notification when someone subscribes. In this file you can also modify the success and error messages. It’s all commented, you’ll not make mistakes. You’ll find the logo, favicon (along with the apple touch icons) and social media icons in the “img” folder (/assets/img/). Replace them with your own images and customize them from the “index.html” and “style.css” (/assets/css/style.css) files. Note: in the CSS “background-size” property insert the size of the normal image (not the size of the @2x version). My question is : is there a way to have the subscriber emails go into a text file instead of an email? or is it possible using other services like mailchimp to accumulate all the incoming emails and extract the address into a file for future mass email? Thanks! Yes, you can do all of this with some PHP programming (in the “subscribe.php” file). Hi, this is very nice , i have a question to you! that may i use all these freebies on your site without giving credit back to you (in footer obvious :-). Thanks. How do you want to use them? i have a question tho. How do i change the timezone of the countdown? mine is 1 hour wrong. Thanks Matt! I didn’t know about this, I’ll try it. Hi admin! i’ve edited ur template and i uploaded it on my sites, payungku.xyz, it works well with desktop browser, but with my mobile, the background and timer didnt load. could you please to help me? on the slide I am susing your code for the countdown, but not sure why the one digit like a 4 or just any one digit is sightly higher than the regular text numbers. Why would that be? Also, I need to make the color of the text in another color – dark blue instead of white. How do you do that? Any help is greatly appreciated. Everything is working fine, but the only problem is, the counter restarts each time I reload the page. The Subscribe button does not work for me, I tried subscribing with an email, there was no message or link of success or failure.